I've read several comments on the forum from folks saying they have never seen a "bad Mak". And here we can see why. These are pretty nice-looking lines. The camera didn't focus on the inside as well as it did the outside, dunno why. The setup was on a carpeted floor and camera was attached to the eyepiece holder, so getting lines to stand still was a challenge. Hard to say if there's a wee problem on the edge or if it is created by the reflections. Ideally, I would have preferred not to have all the lines symmetrical to the center obstruction, but that was hard to control. Edited by precaud, 23 December 2018 - 09:40 AM. Awesome, I was wondering when someone was going to DPAC this scope. Regarding vignetting, my Orion Mak has a washer at the visual back with about a 25mm ID so there is only so much you can get out of it. A 45mm 100* eyepiece must vignette. I can't say what the limit is. 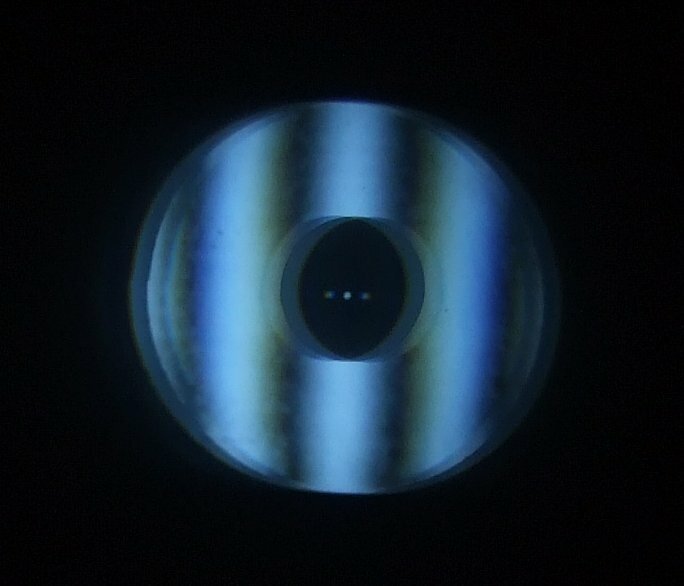 Regarding in and out of focus, Telescope-Optics (.com?) says that these Maks will not have the same views by design. I'm not sure how to Collimate except for centering the Airy disk. It sounds like your Orion Mak came with a 1.25" visual back. Later Orions and Skywatchers come with a 2" visual back. Vignetting gets kicked further downstream to the primary baffle. While that opens things up a bit, the wider 2" eyepieces do exhibit noticeable vignetting. ... the obstruction "hole" was dark on one side of focus but had rings on the other. Precaud, having had three, the SW 180mm maks do display slightly dissimilar rings inside/outside focus. There is absolutely nothing wrong with the SA correction at focus. Secondly that DPAC interferogram is quite nice, so enjoy your scope and don't fret about it. As Peter said, your scope can deliver usefully at 450X. A good friend of mine has an Intes M715D which he regularly uses above 400X for lunar sketching. 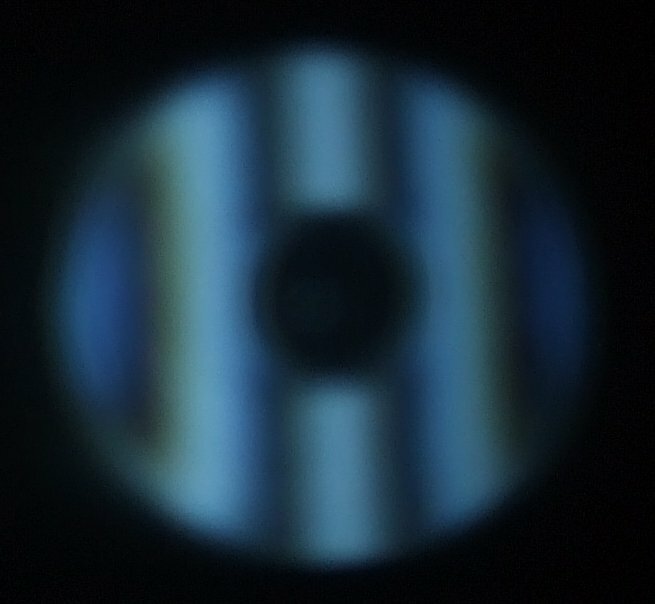 FWIW my Santel MK91 - which is an f/13 Rumak with separate secondary mirror - shows a star test which is absolutely identical out-of-focus and inside of focus, and not the slightest hint of colour. Edited by luxo II, 28 December 2018 - 10:37 PM. Well you should try it, the vignetting isn’t a hard cut-off as you appear to assume. TMB Paragons and a 38mm 70 degree SWA are just fine in your scope. Best low power eyepiece of all however IMHO was a 50mm Vixen LV which gave a view of clusters like diamonds on black velvet. Just to confirm what luxo wrote, I picked up an Orion Q70 38mm SWA, and it is indeed very nice in this scope. Nice and sharp and barely noticeable edge dimming. Nitpicking, contrast is not as good as my 40mm 2" Sterling plossl, but its not bad. If they updated the coatings, it would be really excellent. Regardless, at 67X with 1º TFOV, this will get used a lot. Yes this scope for imaging too, not just visual, i bought this scope mainly or specifically to image the moon, wsn't bad for planets although i wanted better, so i want to see your results from this scope too. Yes, it will get used a ton. Someone donated a bunch of cheap eyepieces to the Bishop Museum. I grabbed the 38mm for the Museum's 12", f15 Cassegrain. Yes, the eyepiece works well at f15. Yes, this was addressed to you, and i asked why not AP too even if you are visual, give it a try, it is a nice scope for visual too of lunar, i enjoy visually with the scope, but i don't stop using it for imaging too, and let me know which eyepieces you love/favorite with this scope for any target you observe. Maybe I'll try some photos when the weather is warmer. But AP is a whole different game than observing. It consumes huge amounts of time and resources. There will always be someone with a better camera, better mount, better computer, better software, etc. and I can always enjoy the results of their work. I look forward to seeing yours. About eyepieces: Because of the long focal length, eyepieces will also be longer to match. Something in the 38-40mm 70º range will give you maximum FOV the scope is capable of. And then steps down from there. On Friday night I did all my observing with 40mm, 38mm, 30mm, and 25mm. That's exit pupils from 2.6mm to 1mm. The images are so clean and sharp I didn't need higher magnifications for detail. For example: NGC 2158, a cluster near M35. It is 11,000 LY distant in the Perseus Arm and normally I have to go to the 10" dob for detail with sufficient brightness. But the SW180 was resolving individual stars in it at 108X ! I was stunned. As a friend of mine who enjoys boxing would say; this scope punches way above its weight. In your signature i see SW350PDS, so how do you use this one then? no mount? if you have an EQ mount for this scope then SW 180mm is just a joke for that mount, 180mm Mak is lightweight, and with this scope of Mak you really don't need long time and many things, just a small planetary camera cheap one and you are ready to go, i use my mount and this scope and a planetary camera and i already have good results of the moon and some planets, software is free, believe me, it is you if you decide to do or not, but visual is nice too. 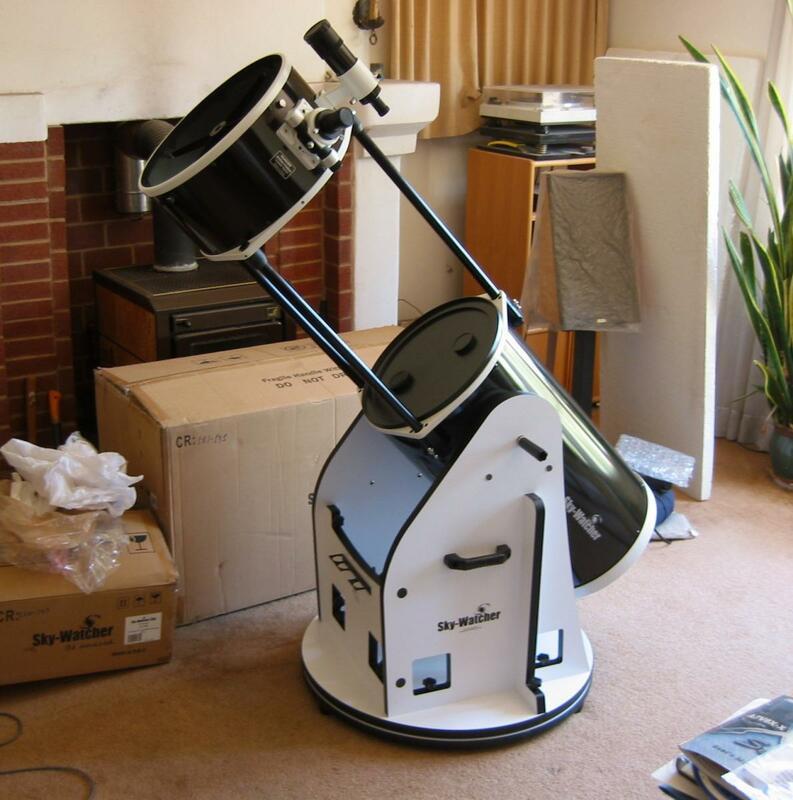 The SkyWatcher 350P is a 14" Flextube dob (see photo). Not suitable for AP. 180mm Mak is lightweight, and with this scope of Mak you really don't need long time and many things, just a small planetary camera cheap one and you are ready to go, i use my mount and this scope and a planetary camera and i already have good results of the moon and some planets, software is free, believe me, it is you if you decide to do or not, but visual is nice too. Thanks for the encouragement. Perhaps I'll try it after winter passes and ask for your advice then. Ah i see, because i don't know there is Skywatcher Dob called 350PDS, only Newtonian tube, fr Dob they don't call it DS because DS is like for Deep Space and a dob isn't, but i think that DS is for DS-16 and i thought it was P, DS, sorry for my mistake. Well, enjoy the visual for now, it is great, i enjoy using it for visual of the moon and the planets no problem, but i really like to see more people with this scope using it for imaging too, i bought it because i saw someone else did mind blowing lunar shots and i am happy to use it for the moon only. I'm cheap and I'm looking at one of the 180mm MCTs in place of a new C8. I had the Intes-Micro 7" f/15 and enjoyed it, but later sold it when I bought a TEC 140ED as my (car) traveling scope. Later still though I still have the TEC I picked up a recent crop C8. It was really nice for car traveling. The C8 is an amazingly small scope for having 8" of aperture. I sold that in favor of a Mewlon 210. A great scope, but given that I have it in a Scopeguard case that is as large as a medium cooler, it takes up a lot of cargo space for an 8"-ish scope. I've considered another C8, but then also miss my 7" MCT. I don't want to spend $3500 on a new Russian 7" MCT so am now considering a Synta 180mm SCT. Haven't decided which label I want (Celestron, SkyWatcher or Orion). Edited by jrbarnett, 08 February 2019 - 08:33 PM. I had a preowned SW180 prior. It had some mirror shift and a tiny bit of coating loss on corrector. I sold it, but ended up missing it, so I repurchased a new SW one from Teleskop express on sale this year. I would not recommend it to anyone as an only scope, but for someone who likes long focal length viewing, good quality views, and understands its quirks/limitations- it is an incredible scope. Little to no collimation, very sharp views rivaling and better 5" refractors but being better on deep sky. Very portable. From your signature i can see you use moonlite with your Mak, can you link from where or which one? No problem! I have purchased 3 moonlite focusers from Rob. Beautifully crafted units and I am always delighted to get them for my telescopes. The problem is i can't really tell which of those ML focusers i should buy, many models and i don't know what accessories to buy, i want to start buying one first for my 8" Newt, then later i can think about for my 7" Mak but not necessary, but i still look at different models even if it says focuser for Newt i still don't know which model exactly and what accessories and i don't know if it is compatible with my scope or not as i really don't like at all to modify my scope or drill it to match the focuser dimensions, and definitely i can't tell which one i can use for the Mak as there is nothing written about that.